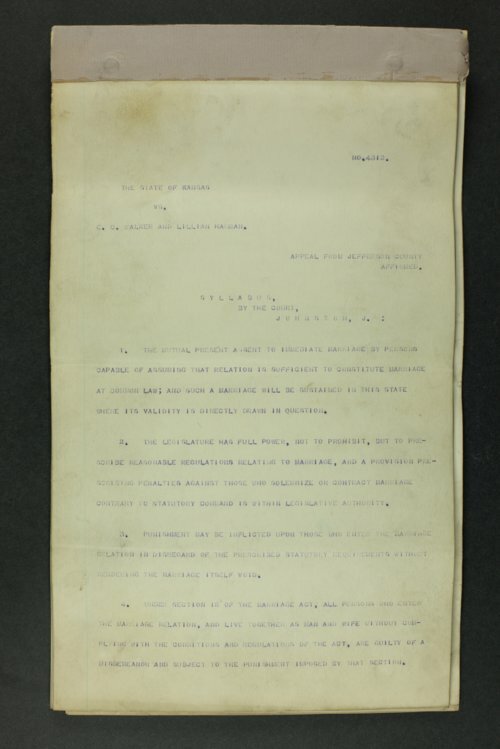 Documents from State of Kansas vs. E. C. Walker and Lillian Harman. Moses Harman (1830-1910) was a free-thought journalist who lived in northeast Kansas from 1879 to 1896. In 1880 he began publishing a paper in Valley Falls to champion his liberal beliefs, including separation between the state and organized religion and legal equality for men and women. In 1883 it was renamed Lucifer the Lightbearer. E. C. Walker of Valley Falls was the co-editor. On September 20, 1886, Harman presided over a marriage ceremony between Walker and Harman's 16 year old daughter Lillian, without a clergyman or justice of the peace present. The couple were arrested for living together as man and wife without being legally married and received short jail sentences, which were extended when they refused to pay the court costs. Harman and Walker appealed their case to the Kansas Supreme Court and the Court's opinion, issued March 4, 1887, affirmed their conviction by the Jefferson County criminal court and instructed the couple to follow the requirements for a legal marriage. This is the Kansas Supreme Court case file, which includes: Appellants briefs, Supreme Court syllabus & opinion by Judge Johnston, original court complaint from the Jefferson County District Court County district court papers; the decision, appeal, and newspaper clippings. Documents from State of Kansas vs. E. C. Walker and Lillian Harman. Moses Harman (1830-1910) was a free-thought journalist who lived in northeast Kansas from 1879 to 1896. In 1880 he began publishing a paper in Valley Falls to champion his liberal beliefs, including separation between the state and organized religion and legal equality for men and women. In 1883 it was renamed Lucifer the Lightbearer. E. C. Walker of Valley Falls was the co-editor. On September 20, 1886, Harman presided over a marriage ceremony between Walker and Harman's 16 year old daughter Lillian, without a clergyman or justice of the peace present. The couple were arrested for living together as man and wife without being legally married and received short jail sentences, which were extended when they refused to pay the court costs. Harman and Walker appealed their case to the Kansas Supreme Court and the Court's opinion, issued March 4, 1887, affirmed their conviction by the Jefferson County criminal court and instructed the couple to follow the requirements for a legal marriage. This is the Kansas Supreme Court case file, which includes: Appellants briefs, Supreme Court syllabus & opinion by Judge Johnston, original court complaint from the Jefferson County District Court County district court papers; the decision, appeal, and newspaper clippings.